Defined by Lawrence as one of the most beautiful places in the world, the island of Capri is a most popular tourist destination for its mild climate all year round, the tranquillity that pervades it, the inhabitants’ hospitality and the colours and magnetic atmosphere of the places. The island of calcareous origin has enchanted writers, poets, musicians and painters. So many celebrities crowded in the past and still flock to the famous Piazzetta Umberto I, one of the most fashionable squares in the world. A lively fruit and fish market in the past it has become a worldwide known place, after the opening of a bar in 1938. The main architectural feature of the square is certainly the Tower of the clock, on which stands the splendid clock decorated with majolica. 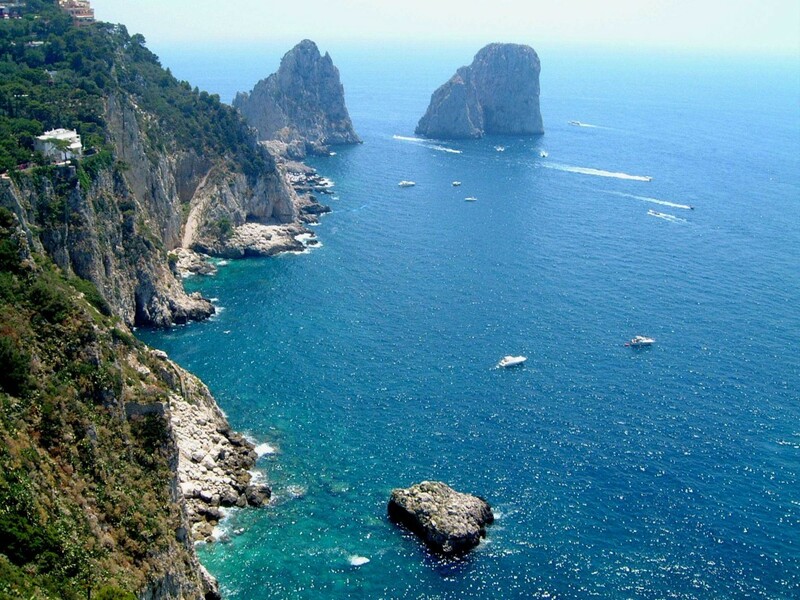 Capri has been inhabited since the eighth century BC, when Greeks and Phoenicians chose it as their home. But the first real admirer of Capri was the emperor Tiberius who settled here in about 26 BC and built 12 stately villas giving each of them the name of a deity. Among these is the famous Villa Jovis, where the Emperor retired to private life. Spread over an area of approximately 7,000 meters it enjoys a view that embraces much of the Gulf of Naples and the island of Ischia ranging up to Punta Campanella. From the mid-19th century artists, intellectuals, writers, exiles, eccentrics and wealthy visitors chose the island as their permanent or seasonal residence, forming a cosmopolitan colony that created the myth of Capri, the Blue Grotta and the famous Faraglioni, three impressive rock formations emerging from the sea, forming the characteristic elements of the island landscape along with the Blue Grotto. The most beautiful view of Capri can be seen from Monte Solaro, the highest point of the island from where the eye has no boundaries. In fact it enjoys wonderful views of Anacapri, the Gulf of Naples, the Sorrentine Peninsula and the Gulf of Salerno. But the historic largest building is the Certosa of San Giacomo, an ancient monastery built in the fourteenth century and still today a place of pilgrimage. The island is administratively divided into the towns of Capri and Anacapri, where you can still walk along quiet squares and streets colored by geraniums and bougainvillea. Here you can see the Phoenician Steps, stairs connecting Capri to Anacapri and Villa San Michele. It was the home of the illustrious Swedish doctor Axel Munthe, and now it houses an enviable collection of finds from the Roman, Etruscan and Egyptian periods. There is also the beautiful baroque church of San Michele Arcangelo famous for its wonderful tiled floor showing the expulsion of Adam and Eve from the Garden of Eden by an angel with a flaming sword. Very typical are the folk processions in honor of San Costanzo, patron of Capri and St. Anthony, the patron saint of Anacapri, respectively on May 14th and June 13th of each year, during which the statues of the saints are transported while the flower petals are launched from the balconies at the passing of the statues. All the island authorities take part in the celebration, from the clergy, to the members of the local congregations, the civil and military authorities, musical groups and finally the believers. Another famous tradition is the Anacaprese Settembrata that enthrals thousands of tourists and islanders every year. The event involves men, women , boys and girls, showing the most sincere and genuine side of the island, with its mediterranean flavors, typical products, folklore and songs. But no words can describe the perfect beauty and magical atmosphere of this place as well as quietness better than the definition of Capri by Charles Dickens: “Nowhere in the world, there are so many opportunities for delicious stillness, as in this small island”.